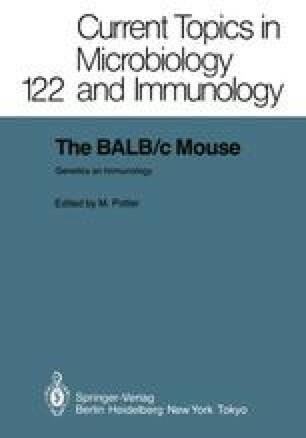 Inbred mouse strains have played an important role in genetic analysis of the various immune mechanisms which regulate leishmanial infections in the host. In these studies early resistance and susceptibility (Bradley 1977), as well as curing versus noncuring (Blackwell, Freeman & Bradley 1980) and healing versus nonhealing (Howard, Hale & Chan-Liew 1980) responses, have been shown to be under the control of separate genes which, with only one exception (Blackwell, Hale, Roberts, Ulczak, Liew & Howard 1985), act against Leishmania species causing visceral but not cutaneous disease or against one cutaneous species but not another (reviewed by Blackwell 1985; Blackwell & Alexander 1985). Hence, individual mouse strains may be equisitely sensitive to one species of Leishmania but quite resistant to another, even though the species may share the same tissue tropism. CBA/Ca mice, for example, are resistant to visceral infection following intravenous (iv) inoculation of L. donovani, develop self-healing lesions following subcutaneous (sc) inoculation of L. major, but maintain large nonhealing lesions even after sc inoculation of relatively low doses of L. mexicana mexicana. C57BL/10ScSn (B10) mice show early susceptibility but later self-cure with L. donovani, develop self-healing lesions with L. major, and nonhealing lesions with L. m. mexicana.